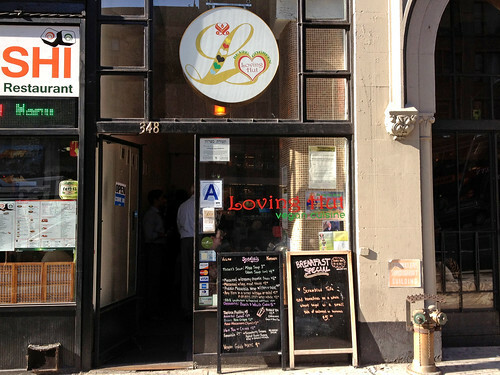 I’ve been hearing great things about Loving Hut’s vegan food for awhile now – but because I haven’t been spending much time in Manhattan lately (living and working in Queens makes me too lazy to cross the river sometimes), it took me until now to give the place a try. The restaurant is tiny, but the staff are friendly and the menu is amazing! Of course, I ordered the veggie burger – but I also got a small order of macaroni and cheese, because mostly-giving-up-dairy has made me eager to seek out the good vegan macaroni and cheese (which is harder to come by than veggie burgers). The patty itself was a tasty blend of rice, carrots, grains (the menu specifies oats), and probably some other ingredients I couldn’t distinguish. Unfortunately, it was a little TOO crispy (I know, I know – I did order the “crispy vegan burger” – but this was more crispy-overcooked than crispy-crunch-awesome). 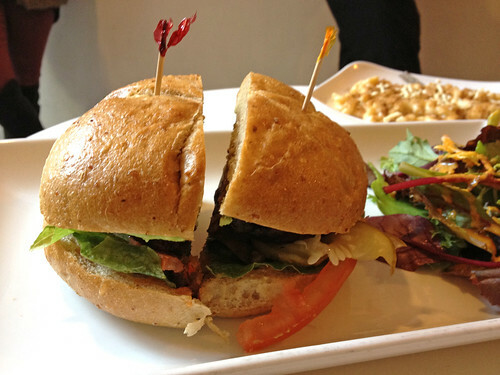 The bun was a tasty, soft whole wheat bun – but a bit oversized for the patty. The burger was served with a side salad. This is a “SMALL” order of the mac and cheese! I couldn’t finish it. Pretty good, although heavily tasting of Daiya – I still prefer my homemade vegan mac, but this was warm and comforting. 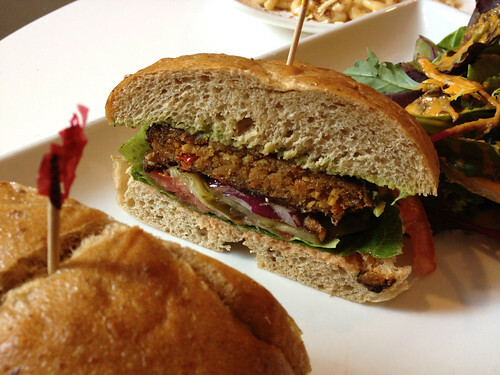 Now that I’ve tried the veggie burger, I am looking forward to coming back to sample more of the vegan food on the menu (seriously, take a look at this menu, it is epic! 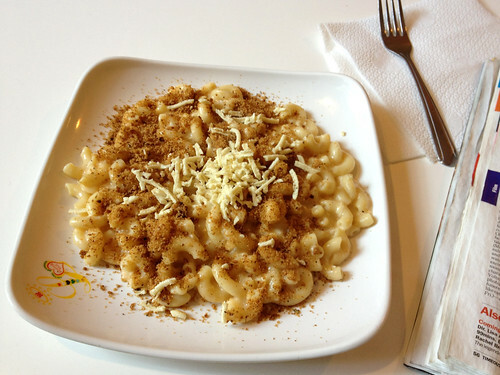 They even have multiple kinds of macaroni and cheese!). Plus, it’s close to Penn Station – which I wish I had realized the last dozen times I took a train or bus out of the city. Next time I will be sure to stop and pick up some food for the trip. Loving Hut’s website says they have a Brooklyn location “coming soon”, as well as locations in 20 different countries and more locations across the U.S. – including two in Hawaii, where I will be next week! I've only been to one Loving Hut, but I was extremely impressed. I love how they do so many different dishes so well; the one in Jersey offers an epic falafel of all things! I work near this location so I get take out from there a bunch and I actually hate the veggie burger! (My workplace sometimes orders it as a vegan option for the vegans here.) I usually order the Cowboy Hero, Quesadillas, side of sauteed broccoli or one of the mac n' cheeses (mushroom or creamy spinach). When I was there last I heard the Bklyn Loving Hut will be in Bushwick so I will probably never end up there but - good to know.